Studio on the Square is committed to helping artists develop their work in book form. We continue the tradition of teaching elegant letterpress printing, as it has been handed down for over 5 centuries. Our intimate classes (most limited to 4 students) allow for individual attention much like an apprenticeship in Gutenberg's shop. With an emphasis on the Art of the Book, we encourage students to free up their thinking & experiment through their art. The Studio prides itself on cultivating creativity within a unique environment where artists engage in the rewarding processes of combining text and imagery. Our teachers are friendly professionals who have been practicing their Art for years. They are at home in the studio, generous with their knowledge, and eager to share yours. Open dialogue & process along with product, distinguishes Studio on the Square workshops (as does our refreshing snack time!). Try our classes in letterpress printing, intaglio, & bookbinding. We welcome Artists & students with all levels of interest and experience. Please call to inquire about the best class for your interests. for the Brooklyn Book Fair! Letterpress Classes or Private Instruction! Register Now for these Unique Book Arts Classes! at Studio on the Square! . . Description: From the historic to the digital and back again, continue your mastery of book arts techniques, as you become more proficient in your use of the Vandercook letterpress and your ability to combine text with various printing processes. Continue your personal journey & develop a discriminating eye, as your book ideas become reality! Description: From the historic to the digital and back again, experiment with letterpress printing, as you set type by hand, in the 15th century tradition. Discover the elegance of working with moveable wood and metal type. 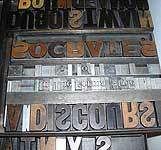 Learn type composition, inking, impression, and press adjustment on the Vandercook printing press. Extend your current art making practice, integrating your own ideas and narrative elements into a broadside edition poster, postcard, greeting card, or print series. You may combine digital, photographic and painterly images utilizing multiple colors and overlays, and add lyrical writing and poetry, as you develop your individual projects. Come get your hands dirty, and make beautiful, multiple impressions! You will go home with a set of two-dozen personalized notecards with matching envelopes, in type you set and printed yourself! Description: Print a small book edition in one day, combining text & image with hand printing & waterbased inks. Even if you have never made an image before, you will gain confidence and amaze yourself and your friends when you show off your very own book! Create and design your image, learn to transfer the image, plan the printing sequence, carve a soft block, and print it by hand with a brayer and waterbased inks. Each letter of text will be set in rubber fonts. Collage elements will be encouraged. Soon you'll have no more blank books collecting dust on the shelf. All aspects of this green printshop can be re-created at home! Description: Gain all the basic skills of binding in this fun weekend. You will complete finished books to use as journals or drawing books including an accordion fold structure with hard covers, an Asian binding, and an album with multiple sewn signatures inside silk covered boards. Learn proper adhesive applications, use of archival materials, professional techniques of folding, cutting, sewing and tool usage. Description: A complicated box structure, in this weekend we will break it all down as you learn to measure, cut, and glue with precision, constructing a sturdy 2-tray clamshell box. This beautiful structure is an art object in itself. You may use it to house a rare book, artist book, album, or portfolio of prints. Trays will be lined with Japanese papers and the box will be covered in silk bookcloth. The size will be approximately 6" x 8". Description: In the tradition of the hand printed, illustrated book a la Gutenberg, print a series relief blocks with 3 pages of text. Learn all phases of creating & printing an image: designing, planning, & transferring the image; cutting the blocks; mixing colored inks; and operating a press. 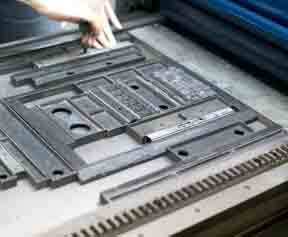 You will set your text in metal foundry type and print it on the letterpress. In this intensive, you will make beautiful impressions in 2-colors, completing 10 printed books! Description: Create classic looking broadsides with our wood & metal foundry type in the tradition of musical posters, poetry and art prints. You will learn how to print on our Vandercook press and will play with various hand printing techniques on and off press, creating colorful, painterly prints. Experiment with handmade papers, collage, and overprinting on existing images. Each student will create a series of prints or small edition broadside. A class print exchange is encouraged for a unique portfolio of prints. Description: Turn your conceptual ideas into an incredible object, & expand your knowledge of designing & printing as you gain the skills to formulate your unique or editioned book. You will be guided to develop your vision & choose the best techniques for your project: wood or linoleum relief, drypoint, etching, typesetting, digital processes and/or polymer plate printing. Create an intimate artwork, explore narrative sequencing, & release your inner voice. Description: Delve into the world of letterpress in this 4-day intensive. Whether you are just beginning or have some printing experience, you will discover an appreciation for working with moveable metal and wood type. 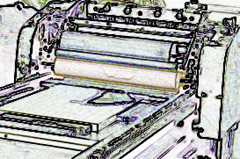 We will begin by printing personal note cards on press and experiment with hand printing multiple colors. You will pursue individual projects, which may include a poetry broadside, wood edition poster, greeting card or print series. Experiment with combining digital images + add lyrical writing. Learn composition, inking, impression, make ready and press adjustment on our Vandercook press, as you create beautiful, multiple impressions! Artist Joseph A. Osina, printmaker, book artist; book & paper conservator at NYPL; founding member of Manhattan Graphics Center; teaches monoptype, bookbinding and book restoration; art work exhibited internationally; collections include the Metropolitan Museum & Library of Congress. Artist Suzanne Vilmain, from Santa Fe, utilizes layering techniques in her book arts and series of ephemeral memoirs; she teaches printmaking, binding, letterpress, and marbling workshops and is interested in collaborations, surrealist techniques of exquisite corpse and deconstructing the book. REGISTRATION: You may register by mail, or reserve a place by e-mail or phone. Register early, as space is limited. Full payment reserves your place in class and is due in full before the start of a workshop. Please fill out the Registration Form and send with check payable to: Intima Press, LLC Mail to: 32 Union Square East, Suite 310, New York, NY 10003. 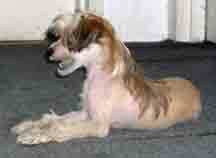 Or, PayPal payment to intimapress@yahoo.com. E-mail questions to intimapress@yahoo.com, or call to inquire at 917-412-4134. We're happy to recommend the right workshop for you! Please click on PDF File below for Registration Form & class listing. Cancellation/Refund Policy: Tuition is non-refundable for cancellations less than 7 days before class. Cancellations more than 7 days before start of class, tuition is refundable minus $40 processing fee. If class is cancelled due to unforeseen circumstances, you will be advised and fully refunded. SUPPLIES: The cost of ink, solvent, rags, and proof paper are included in tuition. Students are expected to supply their own basic hand tools, or may purchase a bone folder or linocut tool from the Studio. *Additional plate and paper costs may be incurred, depending upon your individual project. EQUIPMENT: Studio equpiment includes a Vancercook Universal III automatic motorized letterpress with adjustable press bed - max. sheet size 18.5 x 28 for printing linocut, woodcut, engraving plates, photopolymer plates, wood & metal type; antique foot-pedal press (turn-of-the-century, clamshell style) 9x12 chase; Golding Official clamshell press, 5x7 chase; Ettan Etching Press; Book press; Challenge Guillotine; Great selection of lead foundry type, monotype, wood type, ornaments; Library of artist's books, book exhibition catalogues, chapbooks, and books on typography. STUDIO RENTAL: Studio & press rental available to students in good standing. Copyright Mindy Belloff 2010. Prior written consent required for any use in any manner.